The package is updated daily. Also, there's no patch such as multiplayer or whatever, the source code is the "vanilla". I encourage you send these patches to the upstream if it's possible. Last edited by sergio-br2 on Mon Sep 14, 2015 2:54 am, edited 2 times in total. I kinda wanted to test this package, but i can't get it to work. First, since you included the reicast-joyconfig tool and made a hard requirement on python3-evdev this means no Debian system can install this package. This is probably a big issue with RPi community as well, since their images are mostly based on Debian. Only the newer Ubuntu Mate version on the RPi2 image could install the package. This probably means RPi (the first one) wouldn't be able to install it at all. Still i downloaded and installed the package manually by altering the requirements and tried to run it. Which is odd, cause the package i created works just fine and has the same code it seem (the die shader error is at the same line on my sources). I would have liked to test if multiple controllers are supported, which i kinda doubt, since it only created VMUs for one controller under $HOME/.local/share/reicast/ which indicates that it only supports one controller. Oh, yes.. nearly forgot.. I tested it on an ODORID U3 under Debian Jessie. I changed the python dependence, now it's using the default python of the system (python 2). There's no patch such as multiplayer or whatever, the source code is the same from the reicast upstream, and I encourage you guys to send these patches to the upstream if it's possible. Edit: What's the closest to debian jessie? ubuntu 15.04? Last edited by sergio-br2 on Mon Sep 14, 2015 5:50 am, edited 1 time in total. I know how to change dependencies and how to read dependencies.. As i said, i altered the .deb files dependencies in order to install it. The changed dependency won't work either. Debian has no python-evdev whatsoever (it has python3 though, so that was never an issue). If i was you i would remove python packages completely since they are in no way necessary to run the emulator, they are only for the reicast-joyconfig.py which is not part of the emulator but only a helper script to create new mapping files as i understand, which can easily be created manually. The basic dependecies of reicast are very simple it probably would even run under Debian Squeeze and Ubuntu 12.04 or older. It's really no high dependencies needed. BTW there is one dependenciy missing in your list of dependencies. libevdev-dev which is used by reicast in order to access /dev/input/eventX. sergio-br2 wrote: There's no patch such as multiplayer or whatever, the source code is the same from the reicast upstream, and I encourage you guys to send these patches to the upstream if it's possible. Actually there is and it's listed here in this thread as well, just go one page back. It's also incorporated in my package of reicast and working perfectly fine. The multiplayer issue is already discussed on the reicast github repository. Maybe you just missed that topic. I don't know for sure, but any OpenGL ES 2.0 armhf board should be able to run these packages. I highly doubt there is any limitation. In worst case a simple symlink in /usr/lib/arm-linux-gnueabihf/ should be all that's needed. I may ask a colleauge from work to try my package on the RPi. As far as i know it should work fine. sergio-br2 wrote: Edit: What's the closest to debian jessie? ubuntu 15.04? Debian Jessie is somewhat between 14.04 and 15.10. It has newer Qt5 packages as 14.04 and 15.04 but older packages in other fields. It comes with default gcc 4.8 same as 14.04 and can install 4.9.2 also as in 14.04 and 15.04. It comes with libc6 2.19 same as 14.04 and 15.04. I would normally compare Debian releases with LTS releases, so i would always go with 14.04 to be on the sure side. What I mean is that the package FROM the random stuff PPA has no patch at all (maybe one or two to fix build). I try to maintain it as closest to upstream code as possible. I'm not with the board right now, someone with ubuntu installed can test it and give me some feedback. Any board with sane default paths to libraries should work (/usr/lib/), rpi is not the case. The reicast no longer depends on python, there's a package now for the reicast-joyconfig script. About libevdev-dev, it's in the Build-Depends, but reicast does not use it, this is why it's not in the final deps. Someone in #reicast told me that it's only an wrapper and reicast "talks" directly with the kernel, without this wrapper. sergio-br2 wrote: About libevdev-dev, it's in the Build-Depends, but reicast does not use it, this is why it's not in the final deps. Someone in #reicast told me that it's only an wrapper and reicast "talks" directly with the kernel, without this wrapper. That's what you would normally expect, but that's not how this is build. libevdev.so is only part of the -dev package. besides that, i think i figured out why your package is not working. You said you build "as is" from sources. Well, that's most likely the issue. The default flags won't work for many people. Default for ODROID devices for example is building without X11 support, means only fbdev drivers will work. Most of the ODROID users have X11 systems and drivers installed, that's probably why yours issn't starting at all. And while we are at default flags: You might want consider activating Pulse Audio support as well, since the default is not to include Pulse Audio. There was USE_X11:=1 in the ARMhf rule in the Makefile (near line 90), but later I removed it and I forgot to add that in the debian rules. Thanks! About the libevdev, the source does not use libevdev.h or libevdev-uinput.h from the libevdev-dev, neither it links to the library with "-levdev". I think this evdev implementation is incomplete yet. In 40 min the package will be built, with X11 and PulseAudio enabled. Thanks for the feedback meveric!!! Mainly adding newest changes from upstream, as well as adding requested support for PS3 controllers. I believe the select button is the default "exit the program" key. 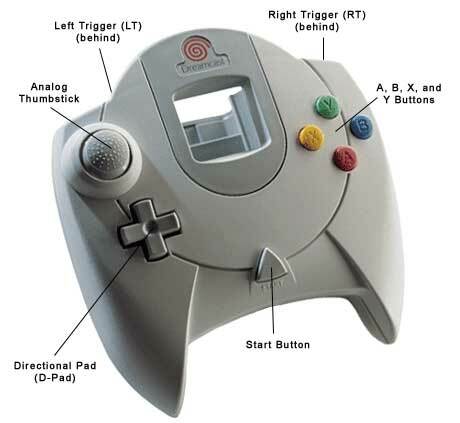 The Dreamcast controller never had a select button, so the button is really not needed for anything. Therefore using the select button as the "Exit"-Button is just a logical choice. As for the select button it seems i just can "press" it. I tried my wireless keyboard/mouse combo,a wired keyboard,a joystick...i think i have tried evey key...nothing.....just nothing can "press" the select so i am stuck on the first --set date time-- screen. Well Linux issn't android. Android has many limitations, for example how often have you used windows in android, to run different programs side by side? Or how often do you start program from a terminal with a commandline on Android? They needed to come up with something for Android, but all these hacks are not required under Linux. You can always just use a symlink that shows to a external folder, or mount a hardrive in that folder to use it. But really it issn't necessary, since besides the BIOS nothing needs to be in the folder. You can place your games wherever you want. tsgiannis wrote: As for the select button it seems i just can "press" it. It looks like you forgot to configure your sytem. Check the emu.cfg file in the .reicast folder. It holds configuration on what device is your keyboard or gamepad. You have to adapt the values in that file to match with your system. Make sure enable_x11_keyboard is activated. So you can control it with keyboard as well. so in order to run a game i should start reicast from console...? or if place it in the data folder i am just fine....? UPDATE...starting reicast from console i get continuous messages that "ALSA underrun occured"
That depends on your needs, you can create start scripts or use a frontend like emulationstation or Kodi to run the games. I use my ODROID GameStation Turbo image where the Emulator is already installed and configured in different frontends. For easy selecting and starting of games. tsgiannis wrote: or if place it in the data folder i am just fine....? As far as I know you can only place one image in the data folder that is used, so you would have to replace the one game over and over again to start it. Yes, and you need a controller to move around and select stuff. Therefore you have to adapt the configuration file called emu.cfg. If the left and right keys are working, then so is keyboard and you probably just need to push x or y to select. I prefer to use my XBox 360 controller though. reicast on linux does NOT support rom browsing. tsgiannis wrote: UPDATE...starting reicast from console i get continuous messages that "ALSA underrun occured"
Normally you should use pulse to start games, it runs much better. There's an option for that in the emu.cfg as well. Once again, on my image all of that is already pre-configured. The magic key for select is "V"
That probably depends on the game. The Emulator is still in development, so it's just naturally that not all games will work perfectly. What game are you trying to play? I might check it on my systems and see how it works. The image is based on Debian Jessie. Debian Jessie is known as a stable server system and apache, mysql and PHP is standard on all Linux distributions. I get a choppy output. I'm using Pulse as the audio backend, changed every option available one by one and I can't seem to pinpoint why it's choppy. If I remove Dynarec, I get a nice smooth output but the FPS is about 10... Can anyone supply a config file for reicast running on Xu3? Just to confirm if it's just me (that means I have something wrong in my system) or it's really that choppy. The speed is there though, just choppy. Even the BIOS Start logo is choppy. ODROID's DO what WinDON'T "That's Blast Processing!" I've played Sega GT European Edition without issues very nicely on my XU3/XU4. Ok, something's weird, I still get some minor choppy-ness. For an average joe, it wouldn't be noticeable but I can see a VERY SLIGHT ghost effect and a fraction of a section chop-like output. But the speed is 60FPS, My bios is also NTSC 60FPS... I can almost say it feels like as if I had a 1 Frameskip on. Try the PAL version. I have one that has an option to switch between 50 Hz and 60 Hz I found many games run better with PAL and 50 Hz (less flickering, some games ONLY work on PAL). I just uploaded a new version of reicast with rumble support. This allows you to have some nice rumbling effects in different games if your controller supports it. The Sega Dreamcast had a controller with two extension ports which could be used, either for e VMU (memory card) or the Jump Pack (rumble pack). There were some other addons like a mic but it's still the same, only two ports for each controller. Anyway, since one slot is now used by the Jump Pack you only have one VMU per Gamepad instead of two as it were before, reducing the maximum available VMUs from 8 to 4. 2. save files on "second VMUs"
If you already used the "second" VMU in one of your controllers, you can copy the save file over another VMU file and still have all the save games. Check for the vmu_save_A1.bin until vmu_save_D2.bin files. Best to make a backup of these (just copy these files in a different folder). that way the first VMU of the fourth controller will be overwritten with the content of the second VMU of the fourth controller. You can also copy from different controllers A2 to C1 or something like that. Please Note: you OVERWRITE the content of the target file, if you had savegames on these files they will be overwritten, that's why you should make a backup first. In the config file emu.cfg you now have an option for the number of players, this equals the number of controllers it should use. To maximize the number of VMUs you have available this option should be set to 4. Have fun with your Dreamcast games. Revert "Fix to windows OpenFile dialog #1238"
Android: 99 problems and a BIOS ain't one. Google Play: "The app crashed, so we violated some policies"
Android: Avoiding faulty references to "things"
additionally I updated the config files for XBox and PS3 controller to work with VMU and jump pack again, as the method of using these changed. I also added controller configuration for GameSir G3W (available from HardKernel). I finally decided to updated to 8.1 and it seems that reicast cannot load any rom anymore now. when I launch a game from the terminal (for exemple: reicast rompath.cdi), it only launchs the system manager and if I select "play" from here, it tells me "Plese insert game disc". I spent a few hours trying to figure out the problem (manipulating Bios, emu.cfg and VMU files), but I had no result so far. Since my system is heavily customized, maybe it's because of something that I have done on my side, but I want to make sure that it only happens on my system... Does it work properly on yours? FYI, I'm still running on the 3.1X kernel. Also I only do targeted update, and only when I need it and after a full backup of the system (like I did before updating reicast). The last time I did a full system update was long time ago, because it always breaks several things when I do that. So it could be another possible reason why reicast doesn't work properly. I also run Kernel 3.10 so that's not an issue. Have you tried removing the emu.cfg file and check that a new file is created? I tested it on my side and it was working just fine. Can you try directly starting it with reicast_odroidxu3 instead? "reicast" is now just a script. You should try .chd files.. Much better than cdi, as they are compressed .gdi files. Yeah I know... I use gdi and cdi files, but I didn't investigate how to compressed in CHD file yet, I just know that only CHD V4 are supported, but I need dig into this. It seems that part of the problem I had is due to the new per game settings feature. reicast adds lines into the emu.cfg every-time you launch a new game, in order to let you add specific settings for each games. I have to adjust my launch script to make sure it doesn't interfere with these lines. But maybe it "supports" more now and takes the first it finds. Also there's another change in case you have your own controller files that you use. To the [dreamcast] section of the controller files. the 1 is the VMU and 3 is the Jump Pack (in case your controller support rumble). On my system it now uses dc_nvmem.bin, it's weird! But it's not a big deal for me. I 'm gonna check the maple_device settings in my files, thank you for the heads up. newtime=$(date +%s); let "newtime = $newtime + 631123200"; let "time_offset = $newtime - 2147483647"; let "newtime = -2147483648 + $time_offset"
It's very strange the way the date is calculated in reicast, it's in seconds from January 1st 1970 + an offset of 20 years. The problem is that we can't use the "date" command in order to add 20 years, because it goes after January 19th 2038, which is the limit of the 32 bit system, so I had to find a work around. Yep I know, I've done that in the past as well. I was to lazy to implement it.